Time for summer. 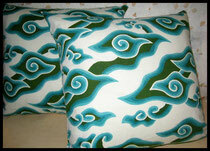 With that in mind, I am thinking about the beautiful cloud pattern batik originating in Cirebon. There are so many color variations of this seemingly simple pattern. It is one of my favorites -- perfectly blending the traditional, with a distinctly modern feel. Chinese settlers arrived in Cirebon (on the north coast of Java), Indonesia in the 16th and 17th centuries. The cloud pattern was found on ceramics and textiles they brought with them to Indonesia - but probably rounder than what is now the traditional batik expression of the form. The rain cloud motif, suggesting fertility and life,* is generally horizontal and the clouds oval, with tapered ends. Textiil has some beautiful mega mendung batiks with 5 gradations of color -- a nice green if you are looking for Emerald the Pantone color of the year, a stunning, traditional, dark blue on deep red -- and even a grey/black mix! See them in our gallery.